As I mentioned earlier this summer, I have been making quite a few omelettes these days. Indeed, I may actually have made more omelettes this summer alone than in all of my previous years in the kitchen. Which is a good thing, because it has given me a chance to perfect them. Or, at least, to improve upon them considerably. 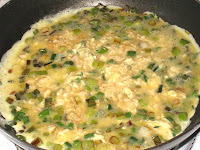 Like the green onion and cheese omelette that I wrote about here. I was proud of this one. It was one of my early attempts and it came out beautifully. I think that may have been what started it all. That, and all of the new cheeses and fresh herbs I was bringing home. 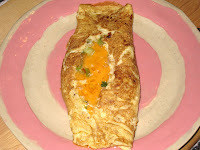 Like this omelette I made with the fresh oregano I bought for the Olive and Walnut Pate recipe I got from Lynda and took to a knitting class get-together (it was a big hit too, Lynda). Oregano is not a herb I usually have in my kitchen so I was at a little bit of a loss as to what to do with the rest of it. And then Sunday came around and the answer seemed obvious. It paired very nicely with a nice double Gloucester (leftover from a batch of pimento cheese) and a little bit of yellow onion. For this one, I caramelized a couple of shallots and some green onions I had on hand, both needing to be used pretty quickly. I still had some double Gloucester left for this one. As you can see, it didn't hold up completely, but it tasted just as good. I think I fell into the "If this much filling is good, then more will be better" trap. And stayed in that trap for this one. Here, I had some beautiful sweet peppers and a red jalapeno that both came from a friend's garden, and an overabundance of fresh corn. 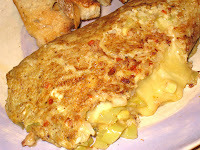 I don't usually make my omelettes spicy, but I had the jalapeno on hand and some queso fresco I used to make corn pudding so the idea just kind of came together in my head. If I had been lucky enough to have some cilantro on hand, this would have been a kickass omelette. Without, it was still delicious. A lot of people are afraid of omelettes, I think because they are presented as a temperamental dish that takes years of practice to perfect. That has not been my experience, but even if it does take years to perfect, the practice runs are usually just as tasty as the final, perfect omelette (which I have not managed, by the way). I wrote about my technique for omelettes back in February, but I thought it might be helpful to have some pictures to illustrate the process, so I'm going to repeat it here. You may notice that the omelette at the top of the page, which is the one I made with these step-by-step pictures, is a little darker and crustier than the other ones. That is because I kept stopping to take pictures. I knew the risk I was running but decided to let it happen so I could get the pictures. And except for being a little crisper on the edges, it was like eating the burnt edges of a good mac 'n cheese; in a word, delicious. If you've always wanted to make an omelette but have been afraid to try it, you really should go ahead and jump in. The worst that can happen is you will end up with some really tasty scrambled eggs. The first thing you do is take two eggs out of the refrigerator so they can come to room temperature. As I've said before, I don't have any documentation for why you should do this, but it does seem to make a softer omelette. Maybe the eggs don't have to cook as long if they don't have to warm up. 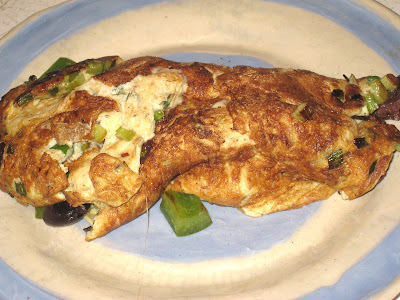 Once you have decided what you are going to put into your omelette, you should think about whether you want to cook it with the eggs or add it as a filling. A good rule of thumb is: the bigger the item, the better to add it to the filling. 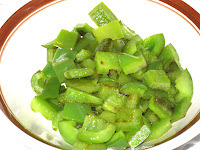 I diced a green pepper and sauteed it in my omelette pan in a little butter, then put it in this bowl for later. 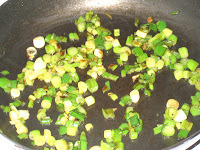 In the same pan, without adding any butter, I added some finely diced green onions and let them cook until they were slightly caramelized. I did not take a picture of this, but in the meantime I cracked my two eggs into a bowl, added salt and pepper and a splash of cold water (about a tablespoon but I did not measure, just took the pitcher and poured from it for less than a second). Because I was going to add some kalamata olives, I decided to throw in a little oregano and marjoram to give it a more Mediterranean twist. Once the onions were ready, I threw another pat of butter into the skillet and let it melt. I took a whisk and beat the eggs briskly and thouroughly. Continuing to whisk them, I poured them into the pan in a steady stream. Once the eggs were in the pan I whisked the eggs in very small circles in the center of the pan, moving out to the edges. As soon as the eggs were too dry to replace the egg I was displacing, I stopped. You want the eggs to set in one big piece. 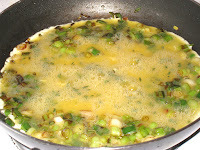 Once the eggs have started to set, but while they are still wet, you want to add your other ingredients. 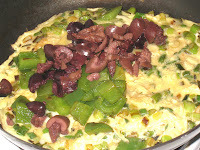 In this case, I added grated cheese, the green peppers, and some chopped kalamata olives. You want to put them a little closer to the middle than I did, because after you let it sit for just a quick minute more you want to take a spatula and fold one third of the omelette over the filling. You do not want to let the egg set completely - remember that it will continue cooking once it is on the plate, so to make sure it stays nice and soft and creamy inside finish it up about a minute or two before you think it's ready. Using the spatula as a guide, I slid the unfolded part onto a plate, flipping the rest of the omelette over the fold as I did so. One of the reasons the omelette above didn't fold as neatly as it should was because I didn't put the ingredients in the middle; the other is because I put too many ingredients in the center. Even with all of its faults, though, it made for a spectacularly delicious breakfast.